It was like Christmas when my second subscription kit arrived from Studio Calico earlier this month. This was the first time I had taken advantage of the their add-on kits. I have to admit that their kits really encourage me to think outside of "my" box. My first layout documents the night I realized through the magic of digital photography that I can't actually cross my eyes. All these years I thought I could! 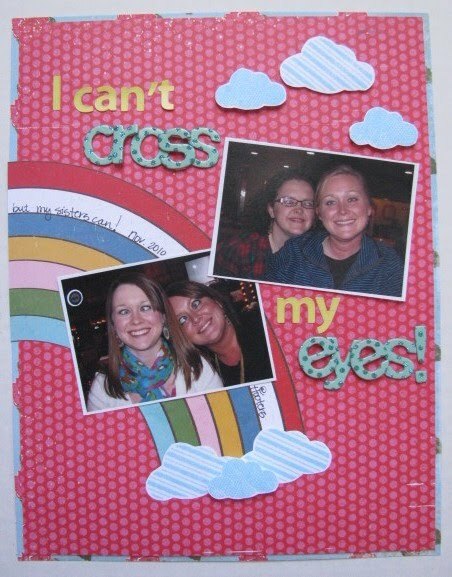 I STAMPED clouds on this layout. Yes, you read that right...I stamped! 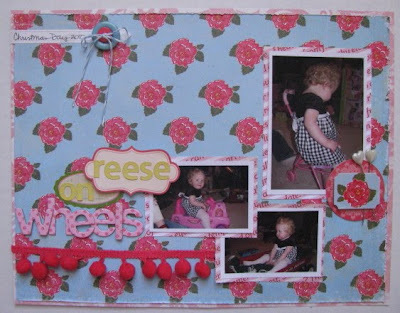 Next I used a very feminine floral on a Reese page. I love this kid! This is actually a layout about Christmas. If it came with wheels, she had to sit on/in it! Aside from using feminine florals, I also put the two stick pins in the kit to good use. For my final layout, I stamped again. 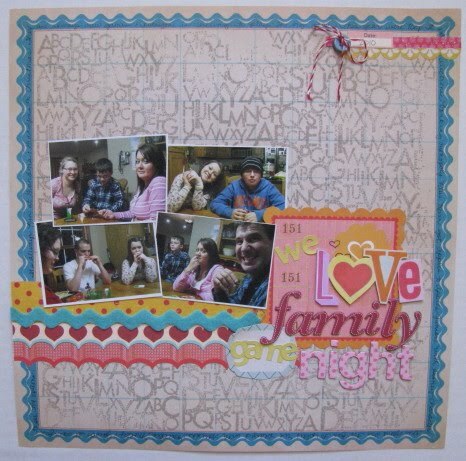 I loved the huge repeating alpha stamp, so I used it to cover the whole background for this layout. It's actually another Christmas page. We always have fun at Mom & Dad's playing the new games on Christmas. I am about two weeks overdue in posting these. I have several other projects to share, but the weather hasn't been cooperating with me. Later this week, I'll be sharing some new layouts I made for Polka Dot Whimsy and Crop Chocolate. Beautiful layouts Amy, that kit looks like a lot of fun to play with! I think its funny you stamped the clouds, since when I first "met" you on the PS board I thought your username indicated you liked to stamp! LOL! I love your family layout!!! I'm always amazed how many great layouts you create! Love that you stamped the alphabet on the family game night page. It looks great! You did so well with this kit. I love all the alphas that you used...was that stash or the kit? Cute! Cute! Cute! The SC kits are amazing. You do wonderful things with them. I love your overlapping alpha letters.